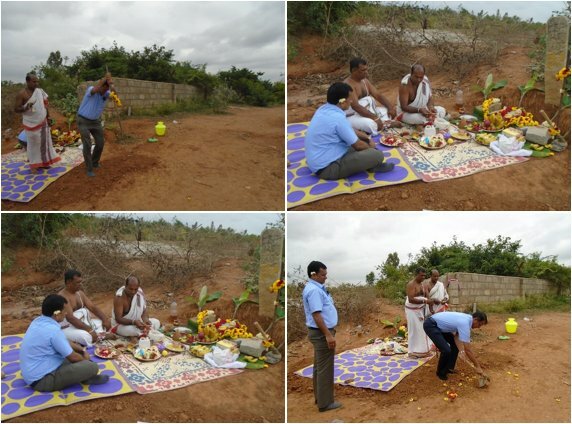 Eigen performed the Foundation Stone laying ceremony and Bhoomi Pooja for its proposed 85000 Sq Ft. manufacturing plant at Aerospace Park, Bangalore on 12th Sep 2016. The Puja was performed in the presence of unit officials. Performing the ground breaking ceremony, Unit Head Mr. M S Nagaraj expressed satisfaction over the start of construction activities of the project which was conceived under his direction. Heavy machinery like road rollers, dumpers and piling machinery were used today and started work on construction of a boundary wall for the plant. The Plant will be ready in 8-10 months and will commence operations by April 2017. The new facility will include CNC machining set up. The CNC Machining will enable Eigen as an end to end service provider.